On many occasions in writing this column, I’ve had to go back and watch the movies I remember seeing on cable television just to refresh my memory, and recall certain items in the narrative. Some movies are more difficult to review than others, because while I can summon the substance of the plot, or perhaps my personal feelings at the time, I can’t remember everything. Nostalgia is key to this. Movies like All Night Long or Jinxed require this level of hand-holding to get the reviews written. 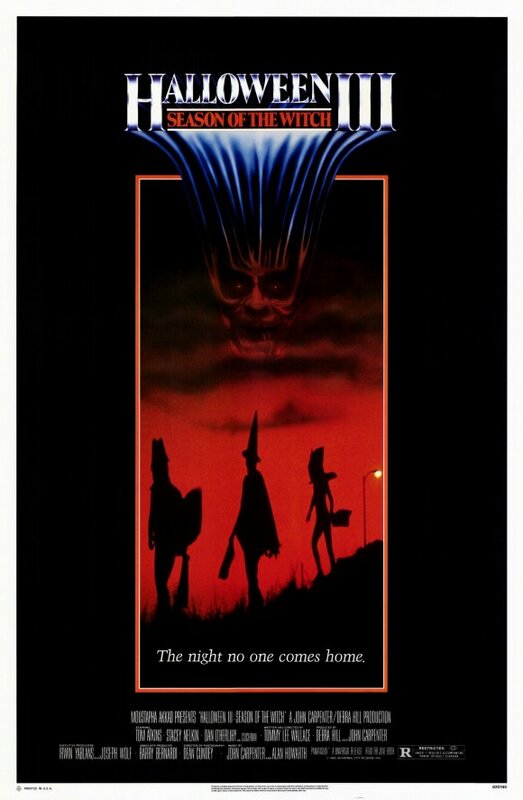 A movie like Halloween III: Season of the Witch does not. Watching it, you immediately understand the movie is not a direct sequel to the Halloween franchise. There is no Michael Meyers in a bizarre (not to mention disturbing) repurposed William Shatner Captain Kirk mask and mechanic’s jumpsuit dispatching horny teenagers with gusto. Instead, we get a kind of brilliant satire, not necessarily a spoof (in the Scream vein) but an ironic piece of gore burlesque about an evil capitalist who wants to use his Stonehenge-enhanced Halloween masks to rule the world. We’re getting ahead of ourselves. Dependable genre movie workhorse Tom Atkins (Creepshow, The Fog) plays night shift emergency room Doctor Dan. He takes in a hysterical man who is clutching a mask (better that than a teddy bear, I suppose) and shrieking, “They’re gonna kill us!” which is not what you want to hear at the end of your shift. Atkins takes a nap. Meanwhile, a man in a trench-coat appears, enters the patient’s room and crushes the guy’s skull. This is enough to make people want to quit working in the medical field. Skull Crusher leaves the hospital, gets into his car, dowses himself with gasoline and lights himself on fire. Well, that’s peculiar. A short time later, the deceased patient’s hottie daughter (Stacey Nelkin from Get Crazy) shows up to claim the body and fill our Doctor Dan in on some strange circumstances involving small-town Halloween mask manufacturer Silver Shamrock. Stacey and Tom masquerade (heh) as buyers so they can get a guided tour of the factory and do a little snooping. They are captured by CEO Conal Cochran and his Stepford-style androids. He does what every bad guy in a movie does. He tells them his plan. Basically by putting microchips in his masks and promoting a “big giveaway” on television, and telling the children to watch the TV screen as a flashing computer pumpkin dances on the screen, the masks will cause their heads to explode in a mass of snakes and insects and bring about the resurrection of Samhain. To save you a trip to the Wikipedia, the definition of Samhain is a Gaelic festival marking the end of the harvest season and the beginning of winter or the “darker half” of the year. I don’t know what this has to do with snakes and insects, but by this point I’m already swept up in the action. This is an unusual horror movie. According to my research, this movie was the first in a planned series of anthology episodes intended to cash in on the Halloween brand. While not an enormous success initially, the film was profitable, but not enough to continue with the anthology plan. It’s worth noting that the movie has a meta sensibility. While having a drink in a bar, Atkins notices a Halloween movie advertisement playing on the television. This is such a fun, well-made movie with competent gore effects and a great mustache-twirling performance from Dan O’Herlihy as Cochran. Refreshingly, the ending is ambiguous with a desperate Atkins calling television stations and telling them to turn off the Silver Shamrock commercial. The image of Atkins goes to black as his echoing voice screams, “STOP IT!”. 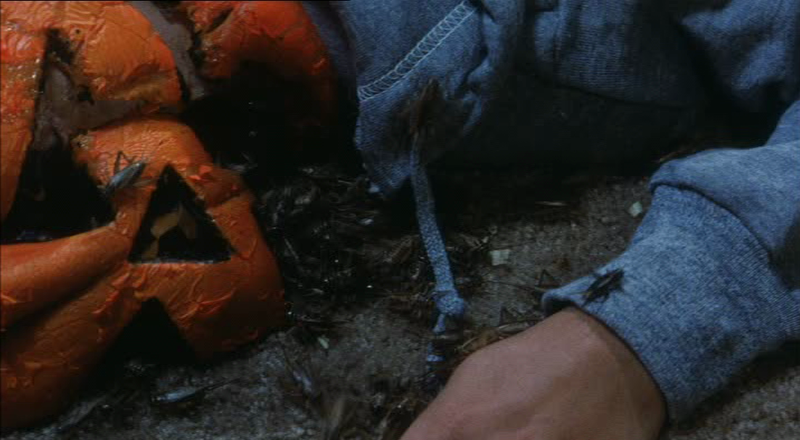 Halloween III: Season of the Witch is a clever suspense-thriller as well as a prescient comment on modern advertising. Next up: Brimstone and Treacle starring Sting from 1983.